We're excited to announce the start of a new Bryant Park tradition this year. Introducing The Tree Lighting Skate-tacular at Bank of America Winter Village at Bryant Park. The evening features music from Big Band Holidays, a new album by the Jazz at Lincoln Center Orchestra with Wynton Marsalis. It all culminates in the lighting of our 8,000 pound 55-foot Norway Spruce, decorated with over 3,000 ornaments and 30,000 lights. 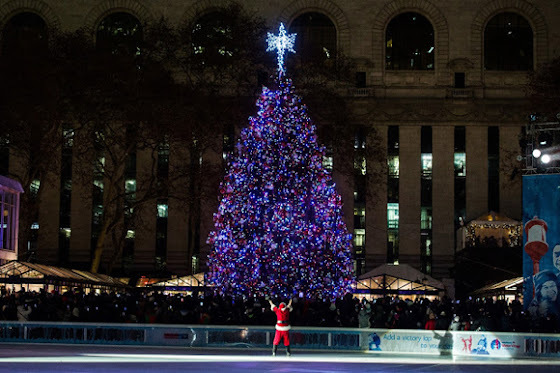 Join us early and explore the Bank of America Winter Village at Bryant Park, our seasonal destination that features a 17,000 square-foot ice skating rink, a glass-enclosed restaurant and an open-air market for holiday shopping under the glow of the city’s lights. As this year’s Tree Lighting Skate-tacular coincides with Giving Tuesday and World AIDS Day; Bank of America partner, VISA, is contributing $.30 to (RED) for every purchase made at participating Winter Village merchants with a Bank of America credit or debit card, helping us sustain the season of giving at Bryant Park and spotlighting (RED) and the impact of their efforts to eradicate AIDS. 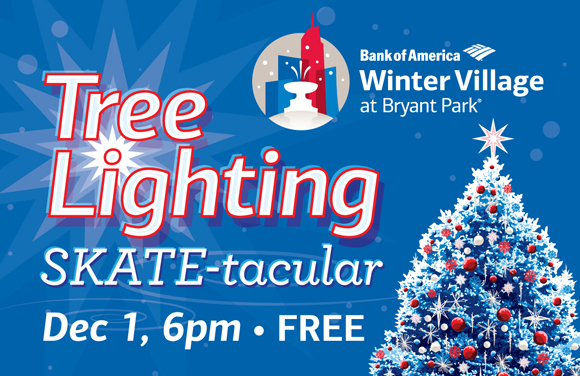 We invite the public to join us on the ice after the tree is lit for a night of skating along to live music presented by The Chris Pattishall All Star Ensemble, curated by Jazz at Lincoln Center. Once the Christmas Tree is lit, you will have until January 10 to view it in person. Will this event be broadcast live by any chance? There are no plans to broadcast the event. If you are able to, you should join us in person! See you there. Due to rain is this event cancelled? We have been looking forward to this event for months and won't let the rain dampen our enthusiasm! The event will go on as scheduled. See you there! If only the webcam were working, I'd be able to see it!